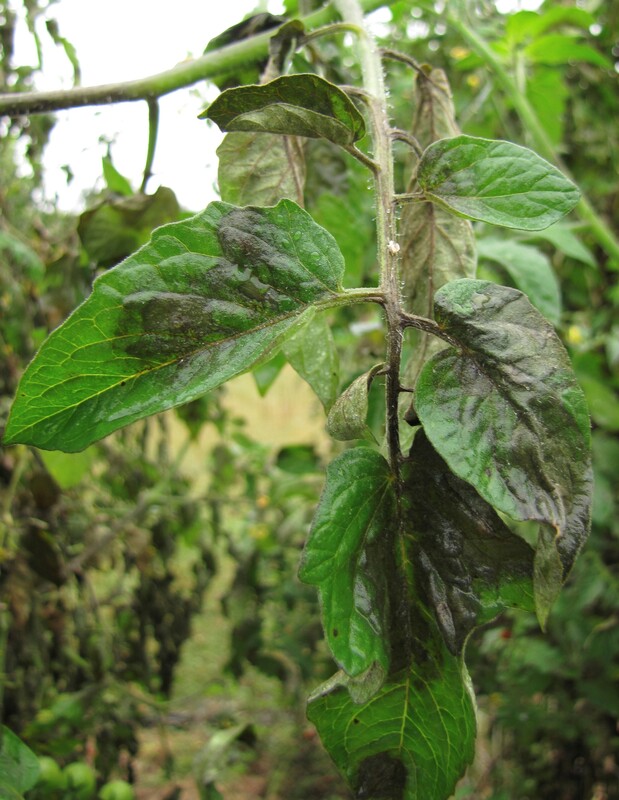 The Horticulture Diagnostic Lab Can Help! Click here for more information about the Horticulture Diagnostic Labs. You can also find many great resources here: http://ccesuffolk.org/gardening. Also, check out this article from the Northforker on the lab! This entry was posted in Horticulture Diagnostic Lab, Long Island gardening and tagged Bayard Cutting Arboretum, CCE Suffolk, Horticulture Diagnostic Lab, insect and tick id, Long Island gardening, plant pests and diseases, soil testing on April 14, 2017 by njc23@cornell.edu. 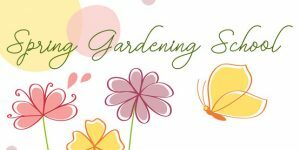 Join us for Suffolk County’s annual Spring Gardening School on Saturday, April 22, 2017, 8:30 a.m. to 4:00 p.m. Organized by Master Gardener Volunteers for the last 35 years, this beloved event kicks off the growing season for hundreds of gardeners who gather together for a day of learning and fun. Spring Gardening School 2017 will be held at Longwood Senior High School in Middle Island, NY. All classes are taught by Master Gardener Volunteers and Cornell Cooperative Extension Educators. The day consists of workshops held during three sessions and offers classes for beginners to advanced gardeners. This year a keynote address on “Long Island Native Plants and Pollinators” will be presented by Polly Weigand, Executive Director of the Long Island Native Plant Initiative. You can sign up for such classes as Gardening with Chickens, Design & Install Drip Irrigation, How to Attract and Enjoy the Ruby-Throated Hummingbird, Low-Water Gardening, Seed Starting Demystified, and many, many more. The fee to attend is $65 per person ($60 early bird, before March 1st), which includes free soil pH testing, a Long Island Gardening Calendar, a plant diagnostic clinic, gardening exhibits, and an early plant sale from some of the finest nurseries on Long Island; continental breakfast, delicious boxed lunch, raffles, and door prizes. Pre–registration is mandatory; first come is first served. Here is a registration form with a full schedule of classes and their descriptions for you to download and send to us. We look forward to seeing you there! This entry was posted in Horticulture Diagnostic Lab, Long Island gardening, Master Gardener Volunteers and tagged CCE Suffolk, gardening workshops, Horticulture Diagnostic Lab, Long Island gardening, Master Gardener Volunteers, Spring Gardening School on January 30, 2017 by njc23@cornell.edu. Join us for Suffolk County’s annual Spring Gardening School on Saturday, April 16, 2016, 8:30 a.m to 4:00 p.m. Organized by Master Gardener Volunteers for the last 34 years, this beloved event kicks off the growing season for hundreds of gardeners who gather together for a day of learning and fun. 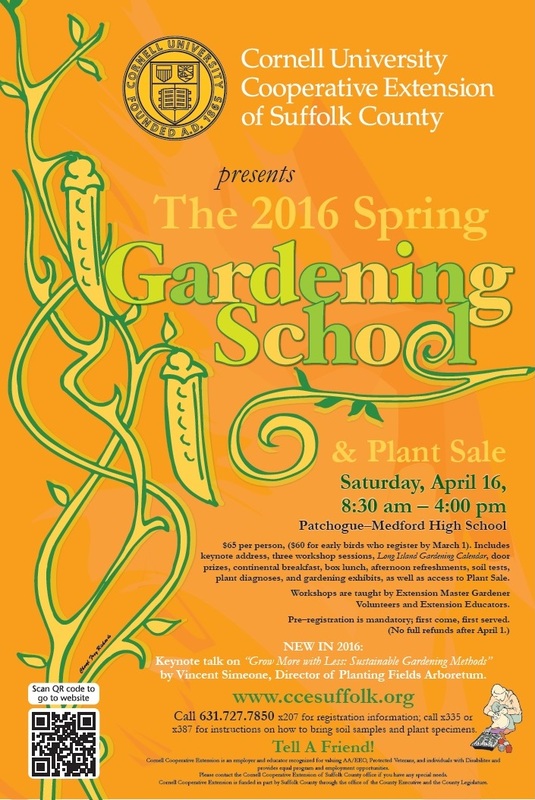 Spring Gardening School 2016 will be held at Patchogue-Medford High School in Medford, NY. All classes are taught by Master Gardener Volunteers and Cornell Cooperative Extension Educators. The day consists of workshops held during three sessions and offers classes for beginners to advanced gardeners. New this year is a keynote session with an address on Grow More with Less: Sustainable Gardening Methods by Vincent Simeone, Director of Planting Fields Arboretum. You can sign up for such classes as Choosing the Right Trees, Gardening with Chickens, Design & Install Drip Irrigation, Pruning Roses & Hydrangeas, Seed Starting Demystified, and many, many more. The fee to attend is $65 per person, which includes free soil pH testing, a Long Island Gardening Calendar, a plant diagnostic clinic, gardening exhibits, and an early plant sale from some of the finest nurseries on Long Island; continental breakfast, delicious boxed lunch, raffles, and door prizes. Pre–registration is mandatory; first come is first served. Here is a registration form with a full schedule of classes and their descriptions for you to download and send to us. We look forward to seeing you there! This entry was posted in Horticulture Diagnostic Lab, Long Island gardening, Master Gardener Volunteers and tagged CCE Suffolk, gardening workshops, Horticulture Diagnostic Lab, Long Island gardening, Master Gardener Volunteers, Spring Gardening School on February 29, 2016 by Robin Simmen. Last year Suffolk County experienced its driest growing season in over twenty years. 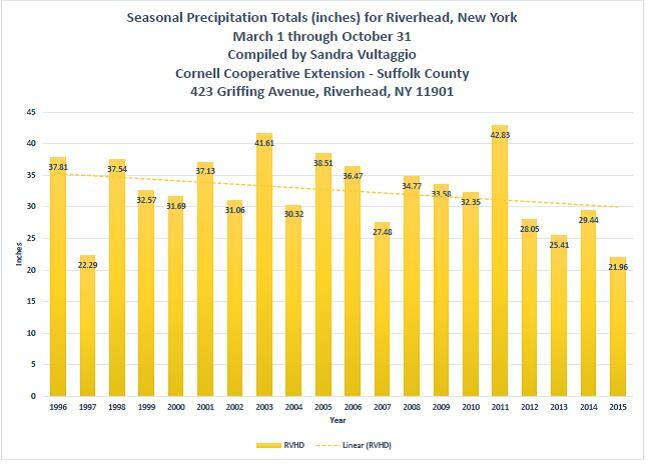 Riverhead received only 21.96 inches of precipitation from March 1 to October 31, 2015, which is 9.27 inches less than the ten-year average rainfall for Riverhead. The last four years in particular have seen a steady decrease in our precipitation, averaging only 26.22 inches in comparison with the previous six year’s average of 34.58 inches. We are surely in a dry spell, but only time will tell what 2016 has in store for us. So what did last year’s dry season mean for our landscapes? For one thing, we dragged the hose around more often in an effort to keep plants alive. This was especially true for container plantings, vegetable gardens, newly planted plants, and probably your lawn. Then again, if you left your landscapes to fend for themselves last year, it’s possible you’ll notice more winter damage this spring. New plantings and transplants, especially of larger trees and shrubs, are probably the hardest to maintain in droughty growing seasons. Keeping the soil moist is very important for establishing strong plants. During the first year of planting, be sure to water trees deeply at least once every week during dry spells; with rainfall, once every two weeks should be fine. Applying a two- to three-inch layer of mulch around them will help keep their roots moist and reduce evaporation from the ground. During the first autumn after planting trees and shrubs, watering them once every four weeks is recommended. In their second year, these plants should receive supplementary irrigation once every four weeks in the spring, once every three weeks in summer, and once every five weeks in autumn. The key to these waterings is deep and infrequent. 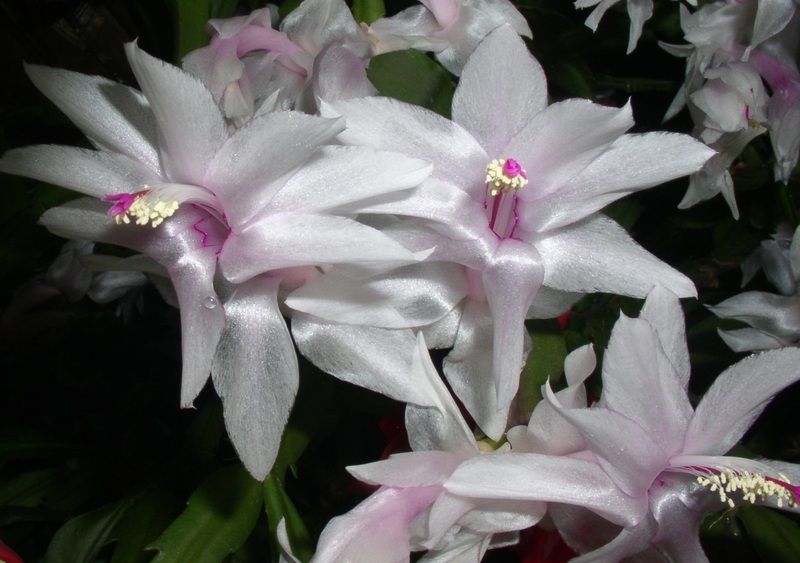 A plant should always enter autumn and winter with ample moisture in its system. Research has shown that mid-August through September is the most important time to prepare plants to tolerate winter stress. 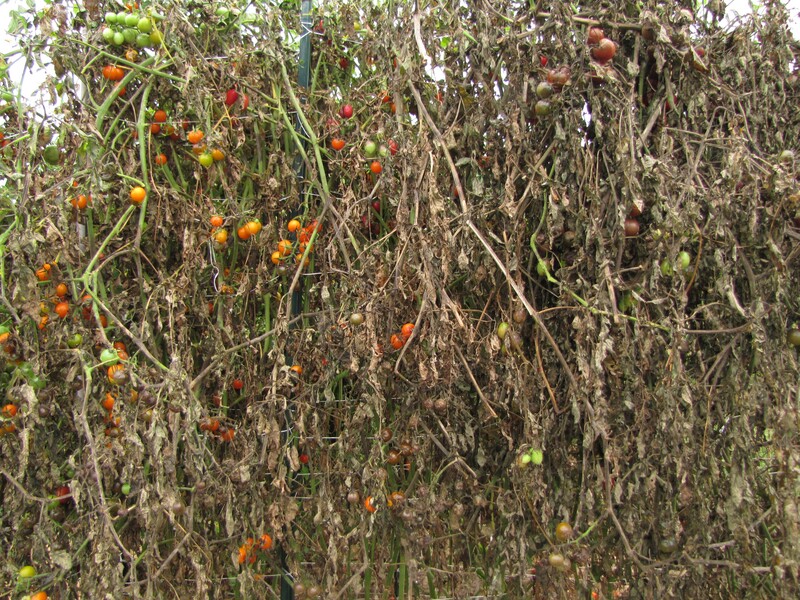 Once winter arrives and the ground freezes, a plant cannot replace water lost to transpiration by winter sun and wind, making it susceptible to winter injury and die-back. Most gardeners set out a few containers and pots of plants around their yard each year. These are the plants we need to watch closely during consistently hot, dry days. The trick to watering containers is just like any of your other plants: Water deeply! Let the water run until you see it coming out of the bottom of the pot, which will encourage roots to grow longer, deeper, and ultimately healthier and more resistant to dry days. This year consider creating containers filled with such drought-tolerant species as zinnias, gazanias, salvia, lavender, and dusty miller, or design contemporary containers filled with ornamental grasses or succulents. You could also invest in some self-watering pots that take the guesswork out of when and how much to water, so you don’t have to water your plants every day to keep them hydrated. Last year after the first flush of spring growth, lawns quickly started gulping for rainfall. Many irrigation systems struggled to keep up with the water demand, and many homeowners without in-ground irrigation weren’t willing to set up sprinklers every day. Typically lawns require an inch of water per week, so professionals often recommend letting lawns without irrigation go dormant over the summer. The majority of lawns on Long Island are made up of cool-season grasses (Kentucky bluegrass, perennial ryegrass and fescues). These grasses look and perform their best in the cooler months of April-June and September-November and prefer to go dormant in the heat of the summer unless they are provided with adequate moisture. Other factors besides drought last year may affect the health of our plants this year. White oaks were severely defoliated by gypsy moths in 2015. Although oaks can recover and push out a new flush of growth in the same growing season, last year’s drought while they were in recovery may be detrimental to their growth this year. Landscapes damaged by Super Storm Sandy may also be set back by the drought as sufficient water is critical to their long-term recovery. And established trees and shrubs that experienced root disturbances from new driveways, fences, pool installations, or any construction job using heavy equipment and machinery, may struggle as a result of the 2015 drought as well. How your landscape will look this year is pure speculation at this point, but bear these thoughts in mind when monitoring the health of your plants in 2016. This entry was posted in Horticulture Diagnostic Lab, Lawn care, Long Island gardening, Sustainable landscapes, Waterwise gardening and tagged drought stress, green grass, gypsy moth caterpillar, Horticulture Diagnostic Lab, Hurricane Sandy, irrigation, Long Island gardening, mulch, rainfall, tree defoliation, watering containers, watering lawns, watering trees and shrubs on February 19, 2016 by Robin Simmen. During the chilly dark days of winter, our houseplants and overwintering tropicals remind us that green life still exists, which gets us crazy gardeners through what can be a depressing time of year. Living with indoor plants is a subject near and dear to my heart, and I have lots of experience to pass along to you. I thought I’d start by talking about how to overwinter the large tropical plants that many people buy in spring, such as hibiscus, elephant ears, cannas, lantana, brugmansia, and mandevilla, and provide some sound advice for houseplant care so you may fully enjoy your indoor garden all winter. 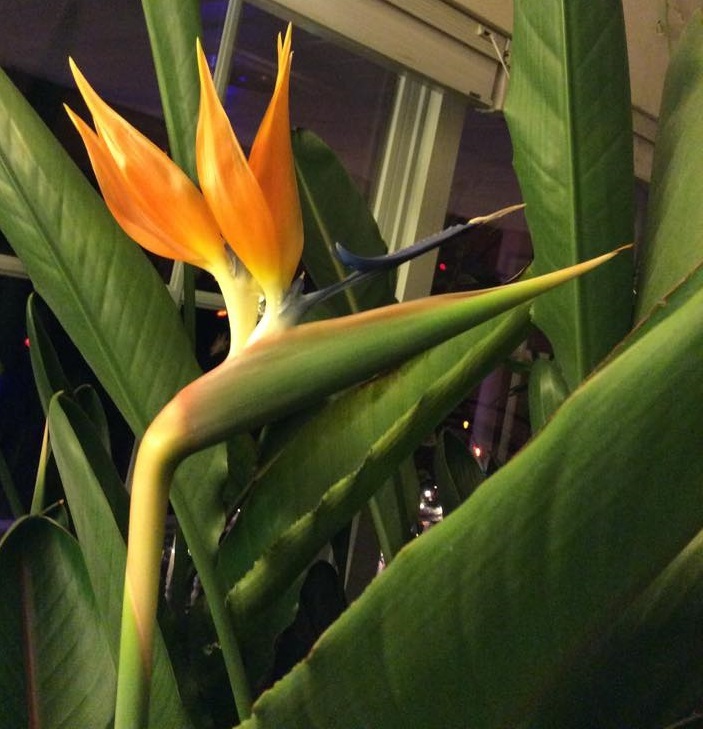 Bird of paradise makes a cheerful indoor companion. Photo © Alice Raimondo. As I write this, it is a relatively mild mid-December day but far too cold outdoors for tender tropicals. Summer provided all the things they needed to survive: sunlight, humidity, water, and lots of air circulation. How can we give them what they need indoors for the next several months before moving them outside once more? I’m sure I’m not the only one whose tropical plant’s leaves all turned yellow and dropped off a few days after bringing it indoors in the fall. A common mistake is waiting too long to bring these plants inside; it’s better to bring them indoors in late August before nighttime temperature start to drop. This is especially true for hibiscus or mandevilla; however, some leaf drop with them should be expected. Indoor environments have low humidity, particularly during winter when the heat comes on frequently, so plants drop leaves to reduce water loss. Fear not, your plants will adjust, provided you site them properly. If placed near sunny south-facing windows and away from radiators, hibiscus plants will perform quite well as houseplants for a while, at least until whiteflies or aphids likely arrive. Mandevilla can be a bit trickier as a houseplant, often losing all of its leaves during the winter and going semi-dormant. Be very careful how you water them then; I have killed several, I fear, from overwatering alone. Mandevilla can also be a magnet for scale and mealybugs in the home, so if other houseplants are nearby, beware! Lantana is best not brought indoors unless you have a sunny, dry, cool location where it can grow. 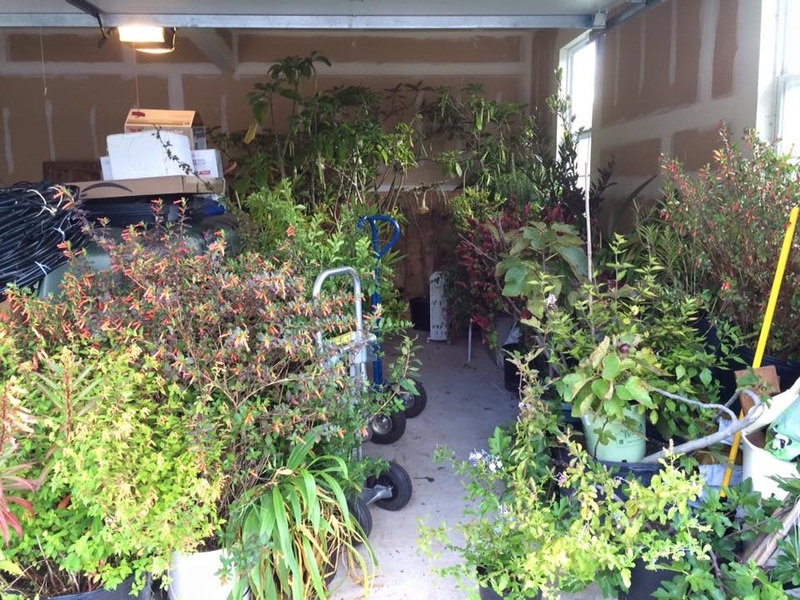 My garage is home to dozens of plants during winter. Photo © Alice Raimondo. Elephant ear tubers and canna fleshy rhizomes can be stored dormant in an unheated location with no light, provided it gets no colder than the upper 40s. If your cannas and elephant ears were dug from the ground after the first frost, they will overwinter very well in paper bags or in cardboard boxes in temperatures in the low 50s. Another plant that stores equally well in garages where it will go dormant is brugmansia. No need to water it but a few times, very lightly, throughout the winter so its root ball doesn’t dry out completely. Keep brugmansia cool at temperatures in the upper 40’s to near 50 degrees; any warmer, and it will break dormancy and begin to grow. You can store this large woody tropical indoors from year to year until the plant is too big to fit in the garage. Even then, you can lay them down in the garage after they’ve grown too tall; these plants are indestructible! I currently have flowers on mine, as they haven’t yet gone to sleep yet for the winter. 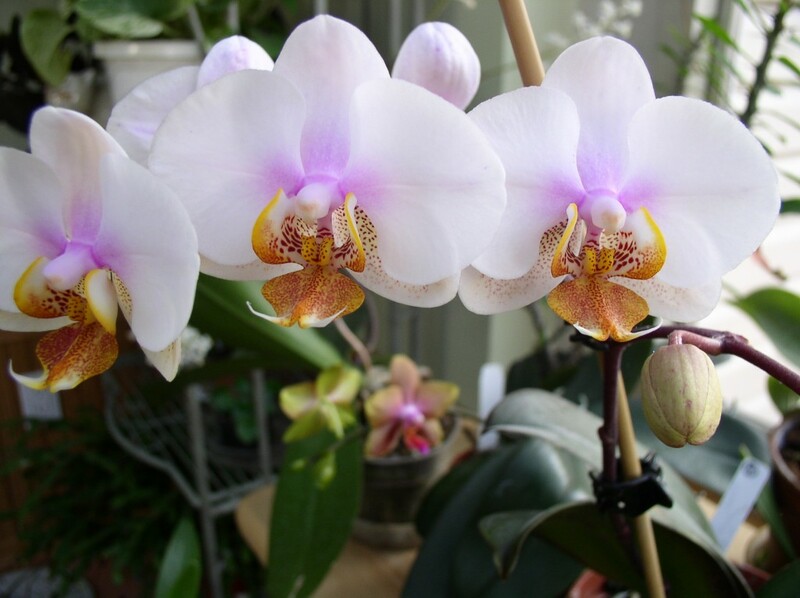 Phalaenopsis orchids do fine with enough humidity. Photo © Alice Raimondo. If you aren’t brave enough to try overwintering these large tropical beauties, which are often sold as annuals, there are many houseplants to grow that are just smaller counterparts of their larger cousins. Peace lily, African violet, phalaenopsis orchids, and many foliage plants will chase your winter blues away as you garden indoors. Or perhaps you have space to grow large palms or bird of paradise. Plan your indoor garden as you do your yard: consider sun exposure, water requirements, and home temperature. One word of advice: water. Overwatering is the most common mistake when it comes to houseplants, so be careful to not kill your plants with too much love. Drooping or yellowing leaves is a symptom of too little water, but it’s also a symptom of watering too frequently. The Horticulture Diagnostic Lab often receives calls regarding sick houseplants during the winter. If you have questions about caring for specific plants, call us at the Horticulture Information line (631)727-4126. In the meantime enjoy your little bit of the tropics indoors, and dream about spring. This entry was posted in Horticulture Diagnostic Lab, Indoor plants, Insect pests and tagged aphids, bird of paradise, brugmansia, canna, elephant ears, hibiscus, Horticulture Diagnostic Lab, houseplants, Indoor plants, lantana, mandevilla, mealybugs, overwatering, phalaenopsis orchids, scale, tropical plants, tubers, whiteflies on December 28, 2015 by Robin Simmen. Weather conditions for the past two years have favored all sorts of winter injury to landscapes; this year may be no different. Droughty summers and autumns followed by long winters filled with wide temperature fluctuations can wreak havoc with plants and soil. But fear not! Here are some simple ways to help your plants come out of this winter unscathed. Needled and broad-leaved evergreens such as arborvitaes, cherry laurels, and rhododendrons often suffer severe winter discoloration, browning, and even death from several causes. Winter sun (think southern exposure) combined with wind can create excessive transpiration, or foliage loss of water, at the same time as soils are frozen so plant roots can’t replace the lost water. This can be particularly disastrous for late season plantings in October, November, and December if plants aren’t well watered and if roots haven’t had time to grow out of the existing root ball. That’s why September is best for fall planting, not November! Bright sunny winter days when leaves warm up may trigger cellular activities such as photosynthesis and cellular respiration. 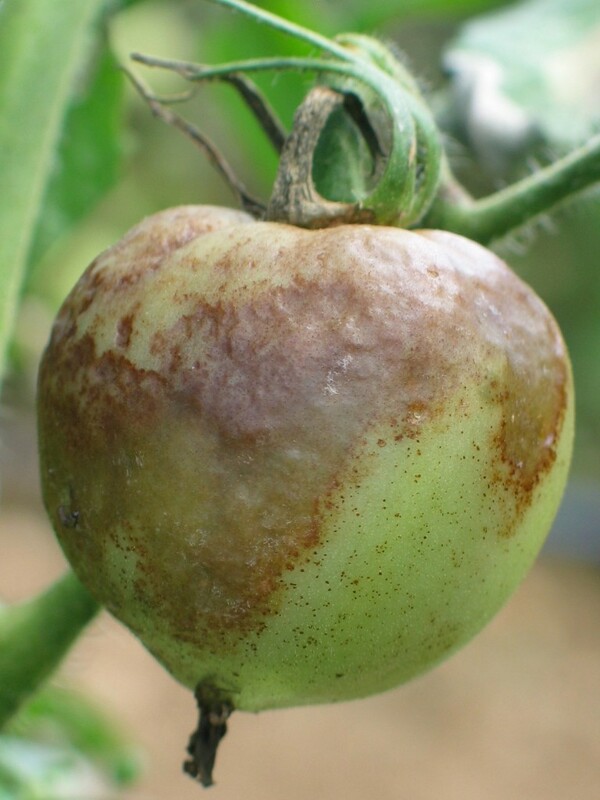 This break from dormancy can result in severe plant injury when nighttime temperatures drop abruptly, for example from the 40’s down to the teens in the course of a day or so. These conditions also bleach evergreen foliage, for example on boxwood, when chlorophyll is destroyed in plant tissue and then not rebuilt due to low temperatures. Late pruning in October, which generates new late season growth, is another cause of injury or death when cold temperatures occur. This sort of injury also occurs in May when light frosts settle into low areas during the time of tender new growth. A piece of burlap posted in front of these inkberry plants will protect them from winter sun and wind. Photo © Alice Raimondo. Protecting your evergreens from these sorts of winter injury is easily done. First and foremost, consider where you locate plants. South, southwest, and windy sites may not be the best places for evergreens. 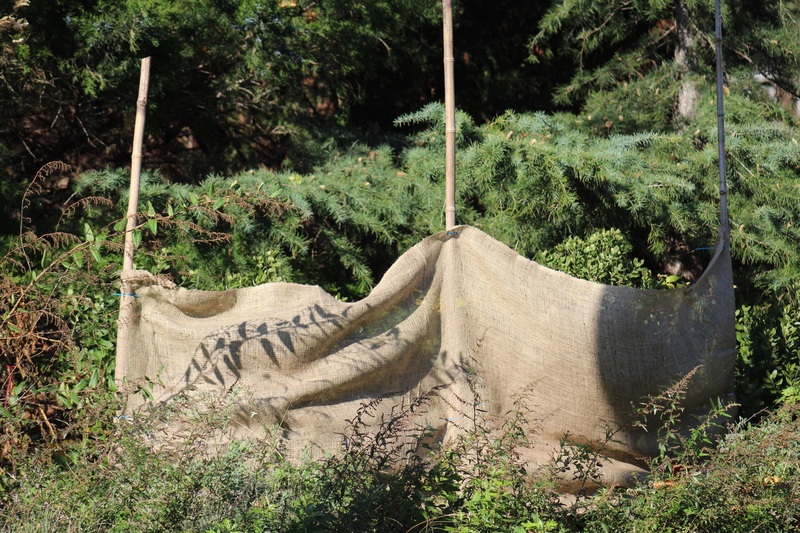 For plants in such sensitive conditions and for those that are less winter hardy, consider constructing a burlap barrier on the southern and/or windy side of the plant to shade it from the harsh winter sun and keep temperatures consistent, thereby reducing the injuries described above. Place the screen in front of the plant; don’t wrap it completely with burlap. Water loss is by far the most important and misunderstood aspect of winter injury. Established plants shouldn’t be over watered in September as this will slow down their hardening off process, but they need to be well watered through October and into November if there isn’t regular, measurable rainfall. This regular watering in the autumn is particularly important for trees and shrubs in the ground for less than three or four years. Anti-desiccant and/or anti-transpirant sprays offer protection that is limited at best, but these can be applied in conjunction with correct watering and sun/wind screens. Sunscald of thin-barked trees (cherry, maple, linden, and plum) is another common winter injury. Sunscald creates sunken, cracked, or dried areas on the trunk, which are elongate in shape. Young, newly planted trees are particularly sensitive to this damage as their bark is not well developed. Shading tree trunks from the harsh southern winter sun helps keep their living cambium tissue dormant, protecting it from freezing temperatures following a thaw. On young and newly transplanted trees, consider not pruning their lower branches for a season or two to help shade their trunks. Cold that follows relatively warm temperatures is common on Long Island and often kills or damages less winter-hardy flower buds such as those of Hydrangea macrophylla. This is why many of us haven’t seen flowers on these beloved plants for the past two winters! The big-leafed a.k.a. mophead hydrangea has a bad habit of breaking dormancy as early as late February in sunny locations. Constructing a sun screen similar to that suggested for evergreens may help reduce this sort of cold temperature injury. Our winters often bring heavy wet snows and ice storms that cause significant injury to plants from extra weight bending and breaking their branches. Protect plants in dangerous locations, such as where snow falls off roofs or where drifting and blowing snows accumulate, by tying or wrapping them to hold them together. If possible, carefully remove heavy, wet snows from plants before the snow freezes solid, encasing the plant in heavy ice. For those of us with new landscapes, a real concern is frost heaving. Our soils tend to freeze and thaw and then freeze and thaw again, sometimes popping smaller shrubs and perennials right out of the ground. This is a big problem for those fall-sale beauties you may have planted in October or that late season perennial dividing and replanting you did the first week of November when it was 70 degrees. You can protect your plants by insulating the ground around them with mulch. 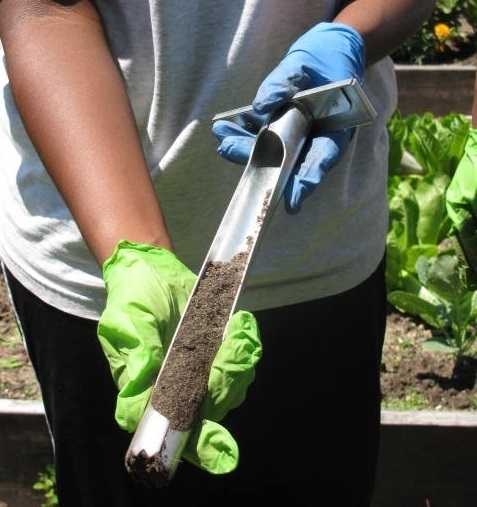 Apply a layer of mulch three-inches thick, being careful to not bury the crowns or stems of the plants. Wait until the ground freezes before applying mulch to keep the ground frozen and discourage rodent activity. Consistent soil temperature will reduce the likelihood of frost heaving. For more information, read the fact sheet on our website about Winter Injury. Hopefully, some of these simple tips will help your plants survive the winter and thrive come next spring. Putting in a little extra time now will reduce spring cleanup of winter-injured plants that need to be pruned or replaced. There’s still plenty of time to prep plants for the ravages of winter! This entry was posted in Horticulture Diagnostic Lab, Long Island gardening, Sustainable landscapes, Waterwise gardening and tagged burlap screens, drought stress, frost heave, Horticulture Diagnostic Lab, Hydrangea macrophylla, irrigation, mulch, pruning young trees, sunscald, winter injury on November 25, 2015 by Robin Simmen.